After his mother was diagnosed with a mysterious form of dementia, Max Lugavere put his successful media career on hold to learn everything he could about brain health and performance. For the better half of a decade, he consumed the most up-to-date scientific research, talked to dozens of leading scientists and clinicians around the world, and visited the country’s best neurology departments - all in the hopes of understanding his mother’s condition. 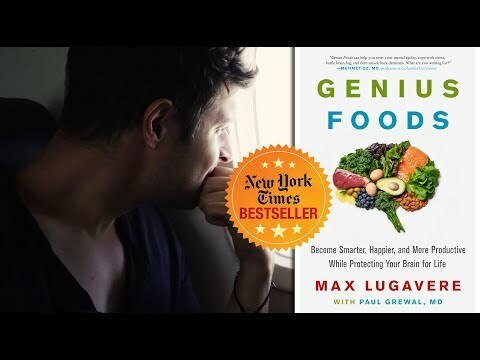 With Genius Foods, Lugavere offers a cutting-edge yet practical road map to eliminating brain fog and optimizing the brain’s health and performance today - and decades into the future. Max Lugavere is a filmmaker, TV personality, and health and science journalist. He is the director of the film Bread Head, the first-ever documentary about dementia prevention through diet and lifestyle. Lugavere has contributed to Medscape, Vice, Fast Company, and the Daily Beast, among others, and is a regularly appearing ''core expert'' on The Dr. Oz Show. He is a sought-after speaker, invited to lecture at esteemed academic institutions such as the New York Academy of Sciences and Weill Cornell Medicine, and has given keynotes at such events as the Biohacker Summit in Stockholm, Sweden. From 2005 to 2011, Lugavere was a journalist for Al Gore's Current TV. He lives in New York City and Los Angeles. This book has changed my life! My thoughts are clearer, my energy levels are steady, and I am more confident on making decisions. I knew a lot of the stuff in this book but I never pieced it all together the way this book does. Well-written and easy to adopt the author's simple straightforward approach to daily intake of quality nutrients the brain needs! Read it, enjoy it, follow it and then get a copy for anyone you care about. This book is changing my way of life and how I look at foods. So helpful and just a joy to read !